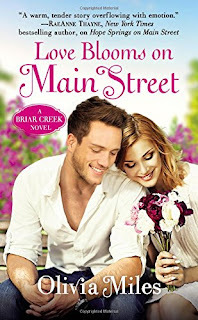 Ivy Birch has been hoping to hear from Brett Hastings for seven months, ever since they shared a kiss that fired Ivy’s dreams at the wedding of her best friend, Grace Madison, and Brett’s cousin Luke Hastings (main characters in Mistletoe on Main Street). Ivy has nourished a crush on Brett since they were in middle school, and she finds the grown-up Dr. Brett Hastings just as appealing. The memory of that kiss is enough to make it difficult to concentrate on her work as Briar Creek’s favorite florist, a job she loves. But when months pass without even a phone call or a text from Brett, Ivy begins to suspect that the distracting doctor is another in a long line of jerks. That impression is confirmed by an unexpected encounter at the local hospital. Brett could not wait to leave Briar Creek, Vermont. A full scholarship to Yale gave him his first opportunity. A free ride to medical school at Johns Hopkins followed, and ranking first in his class helped him secure a demanding post as an ER physician in a Baltimore hospital. Now he is back in Briar Creek, filling in for a doctor on maternity leave after his boss in Baltimore suggests the young doctor needs a change from the high-pressure, big-city ER scene. Brett is determined that his stay in Briar Creek will be strictly temporary. However attractive he finds Ivy, he knows that he, with his fear of commitment and plans to leave his home town as soon as possible, is not the man sweet Ivy with her roots deep in Briar Creek needs in her life. The chemistry between Brett and Ivy proves stronger than his intention to stay away from her for her own good. For a time, the two seem headed for the HEA of Ivy’s dreams. But Ivy’s fear that Brett will follow her overprotective brother’s example in dealing with her diabetes and Brett’s fear that the cost of opening his heart will prove too high may be insurmountable obstacles. Can Ivy and Brett overcome their baggage from the past to claim a shared future? Love Blooms on Main Street is the fourth book in Miles’s Briar Creek series. Readers familiar with the earlier books, particularly Hope Springs on Main Street (the story of Jane Madison and Henry Birch, Ivy’s brother), will recognize the plucky Ivy. She is a sympathetic heroine, and her struggle to overcome her childhood as the daughter of an alcoholic and the complications of life as a diabetic to have a “normal” life give her substance and interest. I found Brett less sympathetic. Despite his abandonment issues and his guilt over leaving his mother when she was ill, he came across as too self-absorbed for my taste. I also felt the ending was rushed and less than fully convincing. Part of the charm of small-town romance is the cast of secondary characters with hints of their stories, but I found all the space devoted to Kara’s career conflicts irrelevant and distracting despite the thematic connection of secrets kept and the need to set up a future book. I really enjoyed the first three Briar Creek books, and I had high hopes for this one. Unfortunately, I ended up viewing LBOMS as the weak link in an otherwise excellent series. If you are a fan of the series, you may want to read this one for the sake of continuity. It is not a bad book, just less engaging than the other books. If you are new to Olivia Miles, I recommend you begin with Mistletoe on Main Street, the first book in the series, to see this author at her best. Disappointing! I have enjoyed this series a lot, so I will probably end up reading this for continuity sake. I was looking forward to this book...will probably look for it at the library.